Petrarch’s last collection of letters, the Rerum senilium libri, concludes with a cluster of letters to his great friend and disciple, Giovanni Boccaccio. 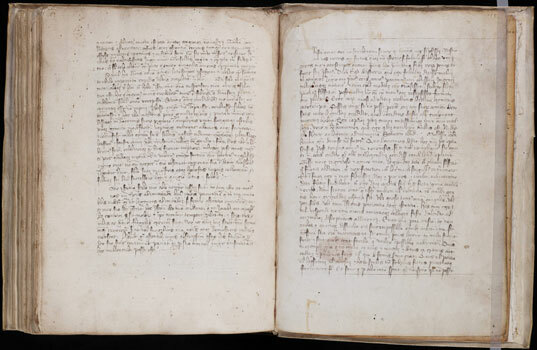 This manuscript contains the last two letters of the collection which focus on the final novella of Boccaccio’s Decameron. The first letter is Petrarch’s translation from Italian to Latin and re-working of the novella about the patient Griselda. The second is a copy of Petrarch’s letter referring to the profound impact the novella had on its first readers, beginning with Petrarch himself. The end of Petrarch’s farewell letter appears on f. 155v of MS 1059: “Explicit epistola domini F. Petrarce. Deo gratias amen.” On the next page is an extensive list of household goods of an early owner of the manuscript; the list includes everything from a lantern and purse to a chess board, book and bell.